New papers on Microbiology of the Built Environment, August 27, 2016 – microBEnet: the microbiology of the Built Environment network. Not surprisingly, bacteria could be detected after swabbing surfaces in ambulances. 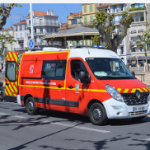 A cross-sectional study was performed in 10 emergency basic life support ambulances operating in Bilbao, Spain, to assess surface bacterial contamination. 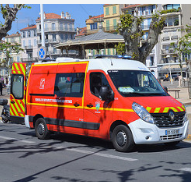 (…) Microbial growth was observed in 73% of ambulances samples: Inner passenger door’s handle, steering wheel and left handle of the stretcher had a higher bacterial load. Coagulase-negative staphylococci were the most frequently isolated microorganism while methicillin susceptible S. aureus (MSSA) was only isolated in two of the ten sampled ambulances. Presence of clinically relevant bacterial contamination suggests that disinfection of the studied basic life support ambulances was not optimal and represents a potential risk of infection for the patients transferred in them. It is critical to implement existing infection control and prevention protocols to resolve this issue. Cultural heritage constitutive materials can provide excellent substrates for microbial colonization, highly influenced by thermo-hygrometric parameters. 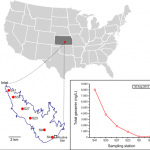 In cultural heritage-related environments, a detrimental microbial load may be present both on manufacts surface and in the aerosol. 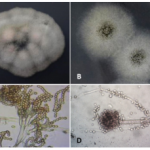 In this study, bacterial and fungal colonisation has been investigated in three Sicilian confined environments (archive, cave and hypogea), each with peculiar structures and different thermo-hygrometric parameters. (…) Results provided information on the composition of the biological consortia, highlighting also the symbiotic relationships between micro (cyanobacteria, bacteria and fungi) and macro-organisms (plants, bryophyte and insects). Occurrence and Potential Biological Effects of Amphetamine on Stream Communities – Sylvia S. Lee – Environmental Science & Technology ($40 for 48h). The presence of pharmaceuticals, including illicit drugs in aquatic systems, is a topic of environmental significance because of their global occurrence and potential effects on aquatic ecosystems and human health, but few studies have examined the ecological effects of illicit drugs. We conducted a survey of several drug residues, including the potentially illicit drug amphetamine, at 6 stream sites along an urban to rural gradient in Baltimore, Maryland, U.S.A. We detected numerous drugs, including amphetamine (3 to 630 ng L—1), in all stream sites. 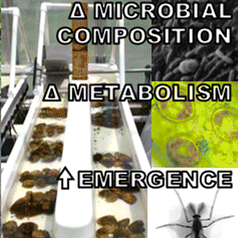 We examined the fate and ecological effects of amphetamine on biofilm, seston, and aquatic insect communities in artificial streams exposed to an environmentally relevant concentration (1 Î¼g L—1) of amphetamine. (…) This study demonstrates that amphetamine and other biologically active drugs are present in urban streams and have the potential to affect both structure and function of stream communities. Also read a critical comment on PubMed Commons by Daniel Himmelstein. Sewage treatment plants (STPs) have repeatedly been suggested as “hotspots” for the emergence and dissemination of antibiotic-resistant bacteria. A critical question still unanswered is if selection pressures within STPs, caused by residual antibiotics or other co-selective agents, are sufficient to specifically promote resistance. To address this, we employed shotgun metagenomic sequencing of samples from different steps of the treatment process in three Swedish STPs. In parallel, concentrations of selected antibiotics, biocides and metals were analyzed. (…) Taken together, metagenomics analyses did not provide clear support for specific antibiotic resistance selection. However, stronger selective forces affecting gross taxonomic composition, and with that resistance gene abundances, limit interpretability. Comprehensive analyses of resistant/non-resistant strains within relevant species are therefore warranted. (…) In order to understand the fate of ARGs and of other resistant forms (e.g. 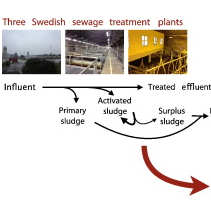 phenotypical adaptations) in urban wastewater treatment plants (WWTPs), we monitored three WWTPs with different disinfection processes (chlorine, peracetic acid (PAA), and ultraviolet light (UV)). (…) While all the pre-disinfection treatments of all WWTPs removed the majority of bacteria and of associated ARGs, of the disinfection processes only PAA efficiently removed bacterial cells. However, the stress imposed by PAA selected for bacterial aggregates and, similarly to chlorine, stimulated the selection of ARGs during the incubation experiment. 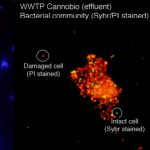 This suggests disinfections based on chemically aggressive destruction of bacterial cell structures can promote a residual microbial community that is more resistant to antibiotics and, given the altered aggregational behavior, to competitive stress in nature. Determination of the diversities and antibiotic resistances of the most abundant aerobic culturable bacteria and their survival in 15 German biogas plants (BGPs). (…) In total, 852 isolates from input and 902 from output samples were identified either by partial 16S rRNA gene sequencing or Matrix-assisted Laser Desorption/Ionization-Time of Flight (MALDI-TOF) analysis. Antibiotic resistance screening of target families against veterinary relevant antibiotics resulted in similar resistance pattern in input and output samples. 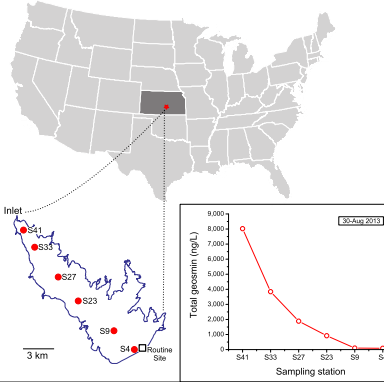 Potentially pathogenic bacteria were detected in output samples of BGPs, but in decreased abundance. The selectivity of the most applied clinical standard media was insufficient. Significance: Only little is known about the release of antibiotic resistant and potentially pathogenic bacteria from BGPs. 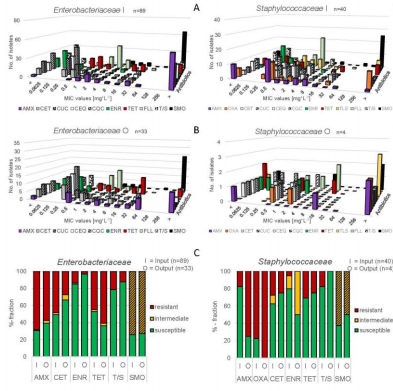 However, this study indicates the detection of several potentially pathogenic bacteria in output samples, which showed several antibiotic resistances. While commonplace in clinical settings, DNA-based assays for identification or enumeration of drinking water pathogens and other biological contaminants remain widely unadopted by the monitoring community. In this study, shotgun metagenomics was used to identify taste-and-odor producers and toxin-producing cyanobacteria over a 2-year period in a drinking water reservoir. (…) We conclude that shotgun metagenomics can be used to identify microbial agents involved in water quality deterioration and to guide PCR assay selection or design for routine monitoring purposes. Finally, we offer estimates of microbial diversity and metagenomic coverage of our data sets for reference to others wishing to apply shotgun metagenomics to other lacustrine systems. PCoA of the weighted UniFrac distances between bacterial communities in raw milk tankers. Currently, the bacterial composition of raw milk in tanker trucks and the outcomes of transfer and storage of that milk at commercial processing facilities are not well understood. We set out to identify the bacteria in raw milk collected for large-scale dairy product manufacturing. Raw bovine milk samples from 899 tanker trucks arriving at two dairy processors in San Joaquin Valley of California during three seasons (spring, summer, and fall) were analyzed by community 16S rRNA gene sequencing. 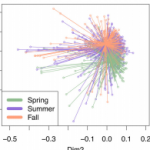 This analysis revealed highly diverse bacterial populations, which exhibited seasonal differences. (…) Overall, despite highly diverse tanker milk community structures, distinct milk bacterial communities were selected within the processing facility environment. This knowledge can inform the development of new sanitation procedures and process controls to ensure the consistent production of safe and high-quality dairy products on a global scale.